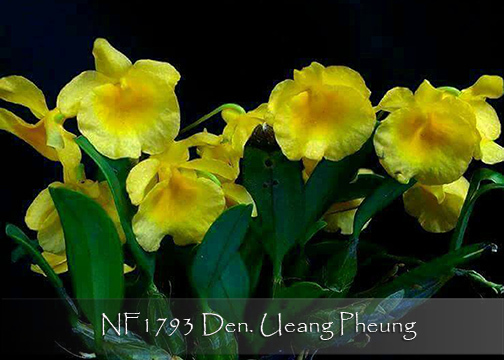 A true miniature free-blooming fragrant Dendrobium, easily grown under Phalaenopsis conditions ! This little hybrid has taken on the best of both parents. It retains the miniature growth habit of its pod parent, Den. jenkinsii, and yet produces beautifully cascading spikes of up to 6 flowers which reflect the larger flower size of its pollen parent, Den. aggregatum (syn. lindleyi). An easy grower, flowering in the spring from each newly maturing growth. The perfect answer for those who love Den. aggregatum but don’t have the space. Ideal for windowsill and under-lights culture. Simply put, a little gem ! Highly Recommended !